So it was our last ski tour of the season, today. 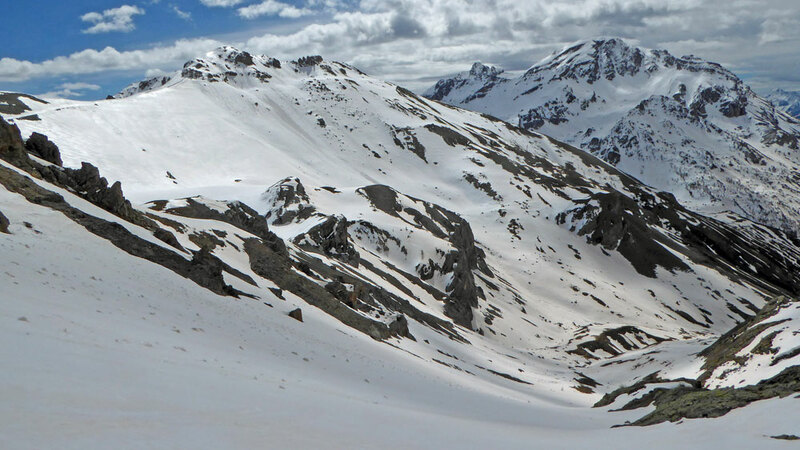 And, although it's nearly May, I was wearing thermals, buff, winter gloves because it was damned cold with a brisk NW wind blowing down the Vallon de Roche Noire, just before the Col du Lautaret. I carried my skies for the first 15 mins while Gav put his skins on and hopped from snow island to snow island until we had constant snow. The trouble was, the cold wind was blowing the powder and not helpiing it transform to classic spring. I was wondering if it was worth it and apparently Gav was, too. But, as neither of us said it out loud, we kept going. 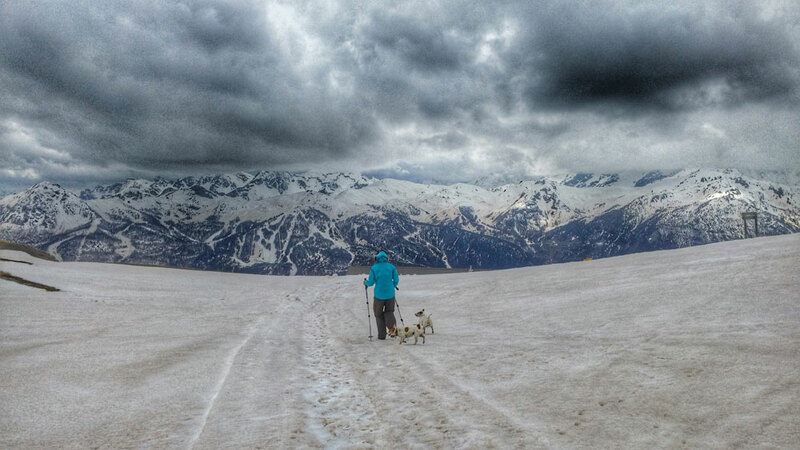 When we stopped at 2600m, the wind was whipping the skins as we took them off, the clouds had gathered over the sun, my buff was frozen solid - and Beanie, the younger Jack, was looking miserable! But, then, the sun came out and we made our way down scoring amazing powder at the top before the long traverse and, then, really pleasant spring snow all the way down to the grass patches. Not a bad last hurrah! 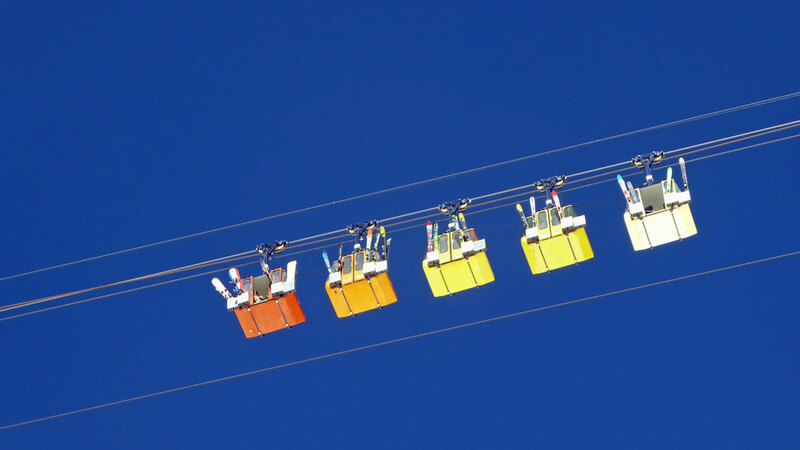 It was a crisp blue sky day, yesterday, a beautiful finale for last lifts in Serre Che. 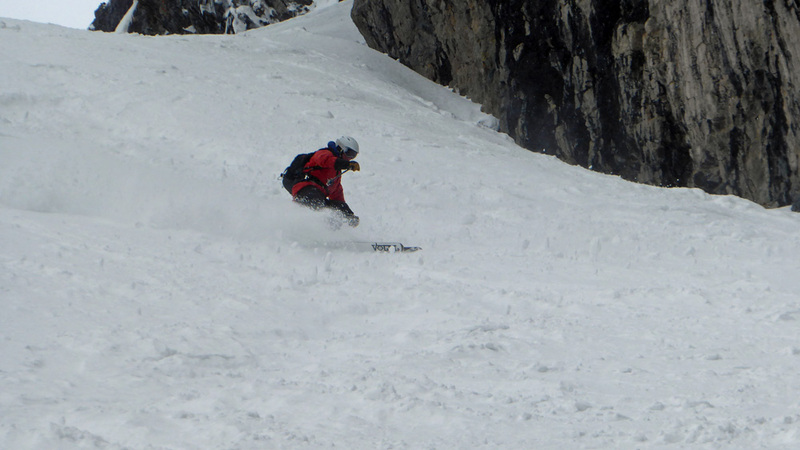 The snow was rock hard early on with a chill NW breeze keeping the conditions fairly hard and challenging off piste. 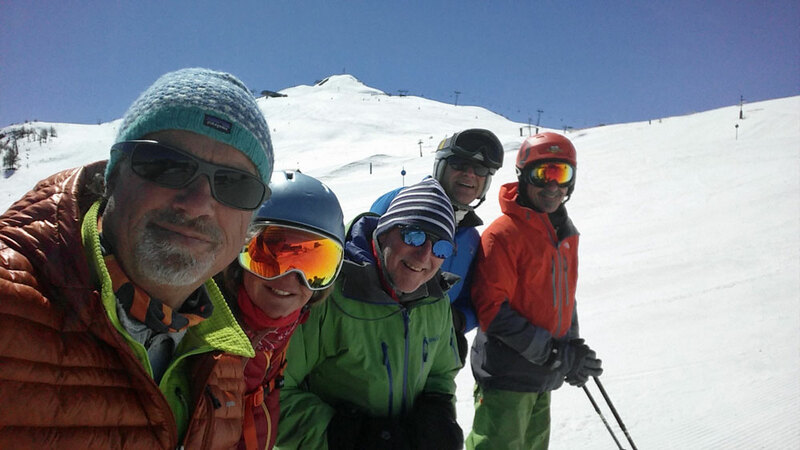 We did the traditional end of season group ski before coming back down to prepare a paella for the last of the seasonaires - and Steve's birthday! There's just one more day until the resort closes. But you'd think it was already over with so few people on the slopes, mostly because the snow is so warm and gripping like leg-breaking Velcro. And, with no overnight freeze to create spring conditions, it's the same in the backcountry. So we've been on stand down for a couple of days, resorting to visiting the marmot sanctuary and, finally, booking our ferry home for next week. But, wait, look at the forecasts! The temperatures are plummeting from tomorrow onwards. So it'll be last lifts on Sunday and, maybe, a cheeky ski tour on Monday and Tuesday. On Tuesday, the day after Gav and the guys had one of the best days skiing La Grave, the majestic mountain, La Meije, spoke,via a massive slab avy, captured by Guillaume Le Guillou Photography and posted by legendary La Grave mountain guide Joe Vallone on Facebook. - see here. 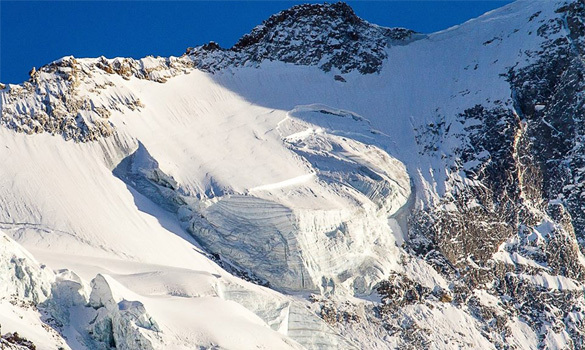 In his words: 'Just another reason why you need to ski these lines fast. Get in and get out. Not a place to stand around and take photos or worse as we saw last week, a skin track up the entire glacier. Crazy aggressive folks out there right now. Simmer down and stick around! We were huddled in puffas on Monday evening - and in t-shirts on Tuesday afternoon. And the snow is all over the place. 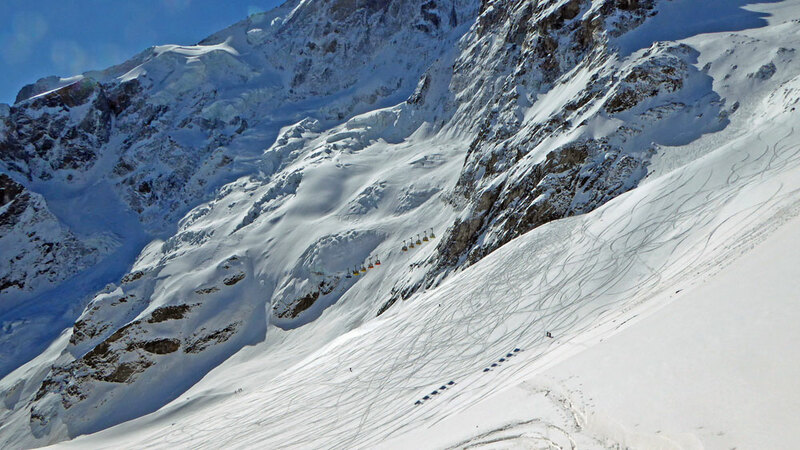 Pow one day (see Gav's report from La Grave, yesterday) and slush the next. We hiked early from the Crête de Côte Plaine up from Lautaret and it was fresh on slush so we kept to the more north facing slopes on the way down. We just managed to ski all the way back to the road, hopping over the prolific grass and mud patches now scarring the lower slopes. 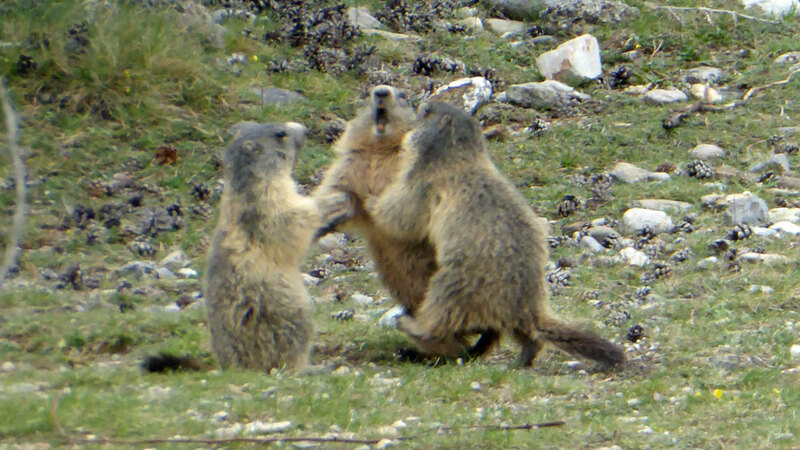 The sun brought out even more marmots to the glee of the Rando Chiens which meant they ended up doing twice the distance that we did. The sun also brought out the Lycra on the roads - and shorts plus flip-flops at an end of season BBQ in the afternoon. It was classic La Grave - 25cms+ over the past two days with the lift closed, yesterday because of high winds. And so empty. I went with Ken Reeve, hooking up with the Serre seasonaires, Pikey (below doing Banane), Skip and Darren plus Oliver and Ben from Ski Connections. In the morning we scored the glacier after the lift opened for 10 minutes and then closed shortly after! 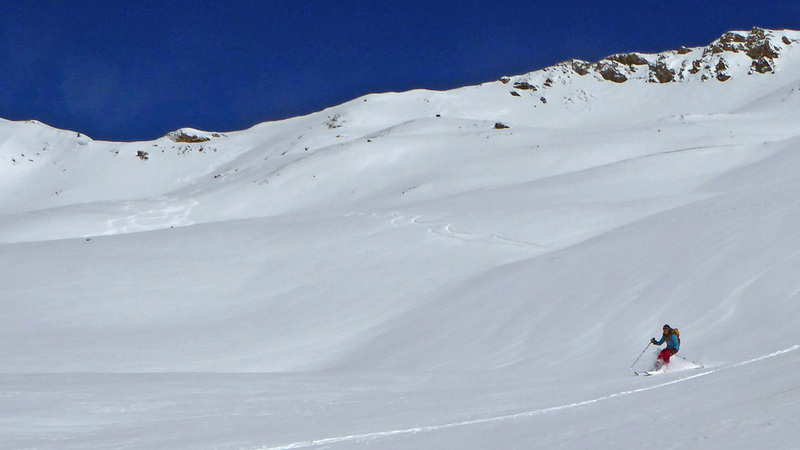 Banane couloir was in perfect condition, though the ski back down to P1 was a tad sketchy towards the bottom. 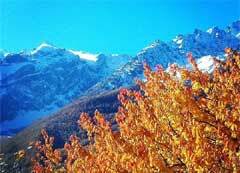 The clouds came over dramatically, yesterday afternoon, while we were walking up the Col du Granon. Then we woke up to the splashing of rain - and it's hardly stopped all day. We drove up to the Col du Lautaret and there was not one car or van parked up for ski touring so it seems no one wants to go out for a wet tour - or walk. 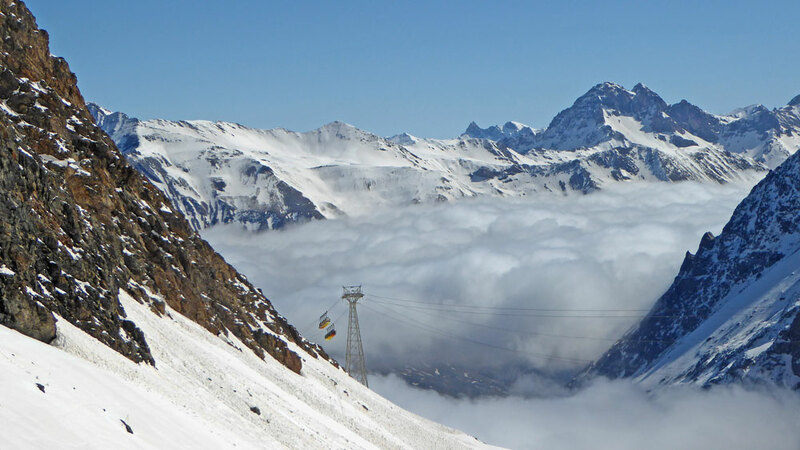 The snow level is around 2000m just before the tunnel at the Col. The lift at La Grave is closed today because of high winds of 70kph. Could be good for tomorrow? 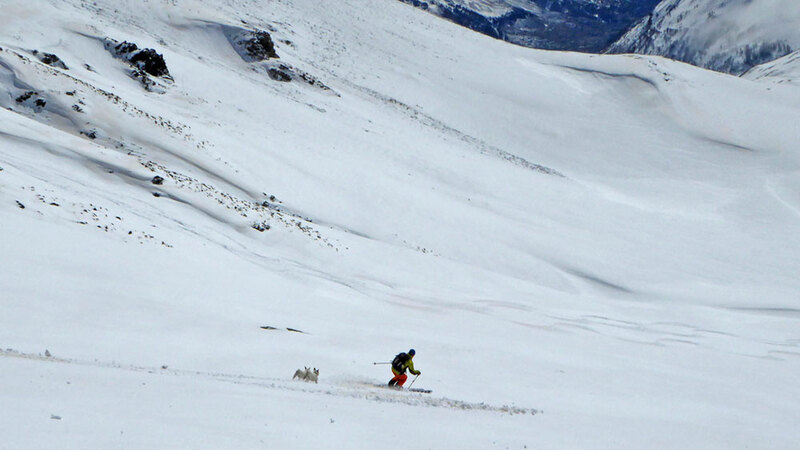 We also have an eye on Tuseday for ski touring. 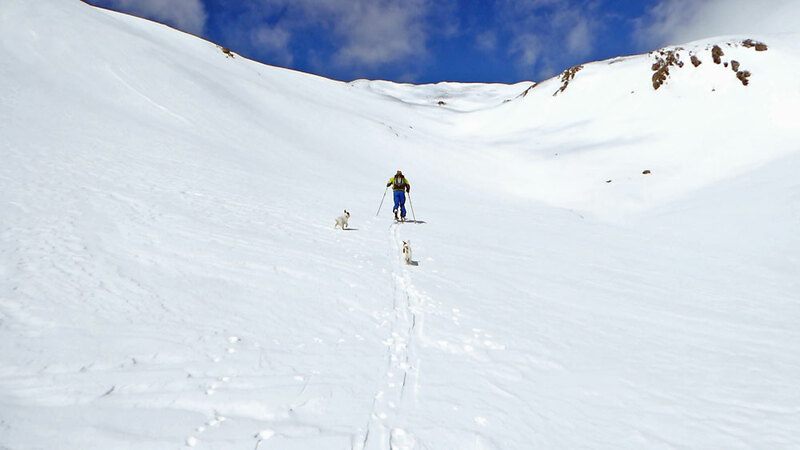 Yesterday, we went to see how much snow is left up the Granon - and it's sketchy except up near the Col. Gav, it seems, is on a mission to set some col bagging record with the Jacks. 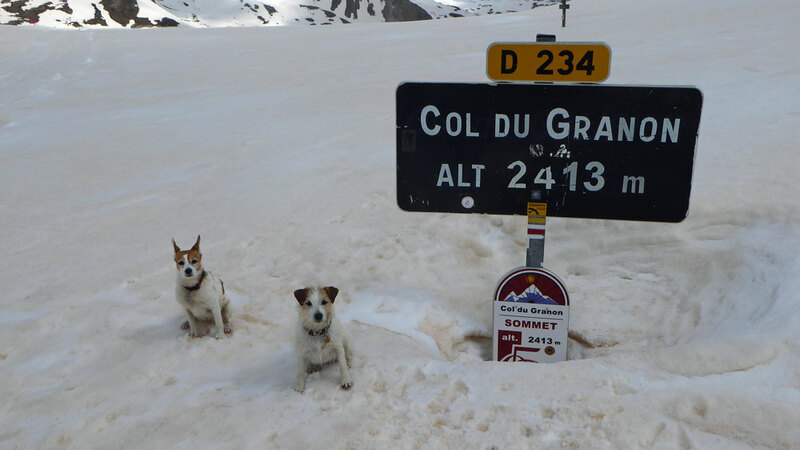 This is their second col, this week, following our tour up Galibier. #thisdogcan ! It was 05.30 when the alarm went off, yesterday. 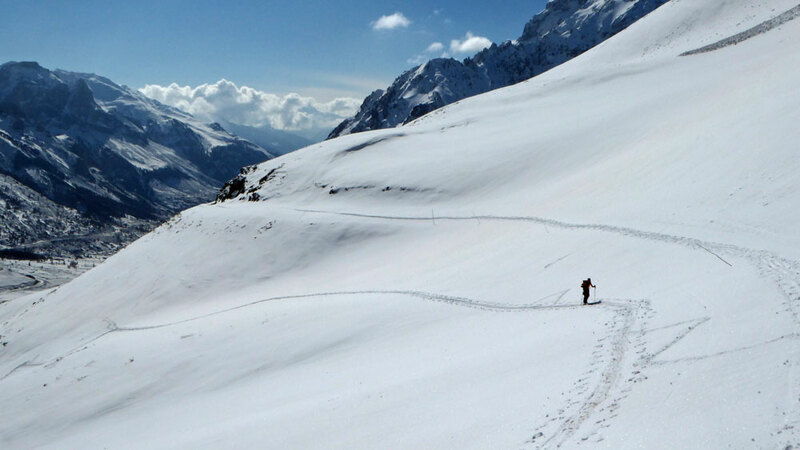 I rolled over and went back to sleep while Gav got up to meet three other members of the Club Alpine Francais Briancon for a two day hike to a remote unmanned refuge. The night before was spent packing a 38L backpack with all the essentials for climbing, eating, sleeping and drinking (including a bottle of red wine!) overnight. At 07.00 he was back! The weather was not looking good. So my two days of peace were over before they began. As the cloud cleared Gav dragged me up the hill for a ski off the back of Yret. Going up the Col du Vent in the chairlift. it was cold, windy and the light was flattening as the cloud came back. And, yes, I had a whinge about going off the Col de l'Yret and down the long Ravine de la Montagnolle when who knows what the snow was going to be like and how we were going to see it with low vis! And the top was pretty crappy but, then the sun came out, it was blue sky and we hit the spring with endless turns all the way down, only having to dodge a rock or two. We put the skins on and hiked up in record time, 35 minutes to the Cucumelle chair. Then it was a quick ski down the empty pistes to the van parked up among only 20 or so other cars at Monetier. 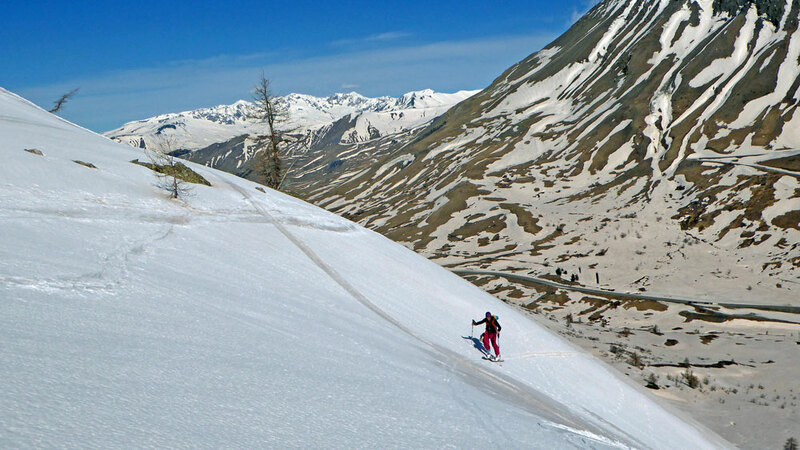 Sadly, this is the last slack country ski from Yret for the season as the Monetier lifts grind to a halt today. I'm wondering if we have the only ski touring Jacks in the world? 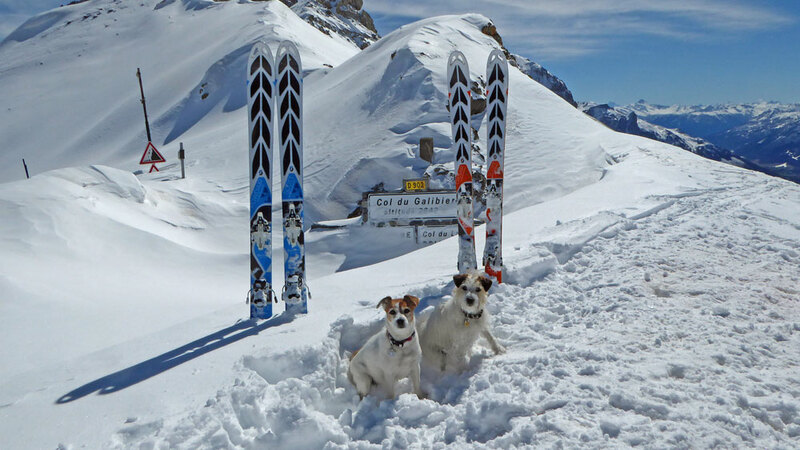 We've certainly met many a Border Collie and German Shepherd but never another Jack Russell on our ski tour travels. 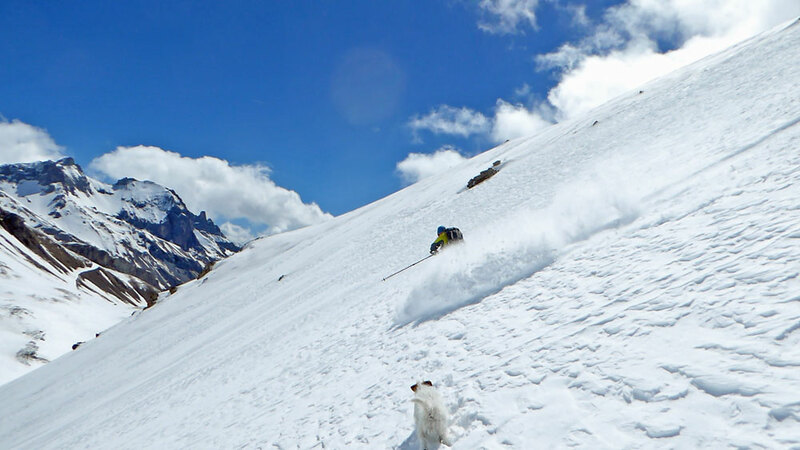 This is about their sixth photo shoot going up and down Galibier, a classic ski tour. Yesterday, we'd heard that around 15cms had fallen up at the Col du Lautaret overnight so we headed there first thing, parking just before the tunnel to do Galibier. 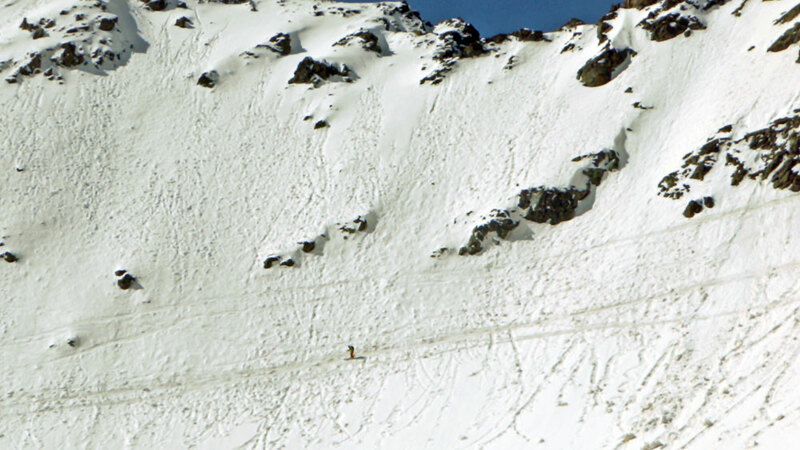 The layers of snow, fresh on spring, meant that Gav set off a mini avy, all of 6m, when climbing up a steep slope. His glove was at the bottom of the slide, so Kiki ran down to check it out. Trouble is, she shook it a bit and then left it so Gav had to side step down to pick it up! We came down fresh powder, then into spring, then slush, but made it all the way to the van on skis. 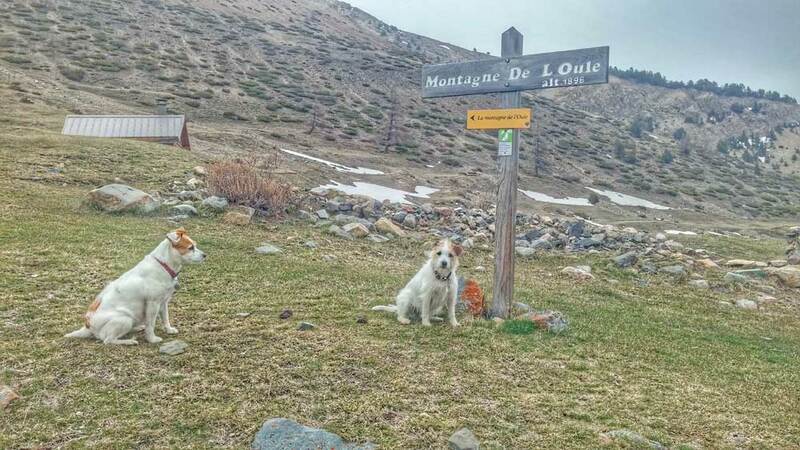 Well it wasn't the dogs' fault that Gav decided that today's randonee on the Col de Laurichard was not in the Park National des Ecrins and, therefore, no problem taking the Rando Chiens. In fact, arguably, it wasn't Gav's fault that they moved the boundaries down the mountain some time after the map he was looking at was created. Going up the NNE facing slopes did bode well for the snow on the way down being less melted and slushy. Trouble was, going up. One part was particlarly steep AND icy, hard to get any edge without sliding even with crampons. We climbed up 550m fairly sedately for two hours with Gav going that extra mile (actually 100m) to the ridge with the Rando Chiens (it was the drop on the other side that worried me rather than the climb!). Then Gav traversed below the ridge (see pic). 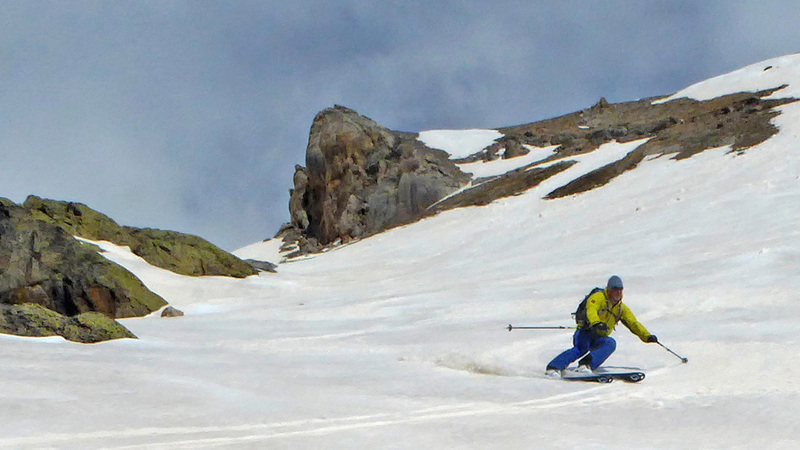 And we skied down, Gav doing a good guide job of finding the spring snow. 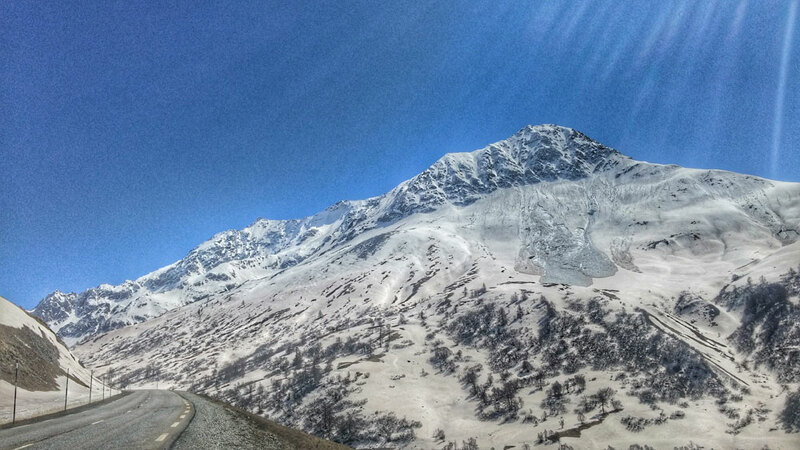 Went off the back, yesterday, and the snow is getting very thin and sketchy towards the bottom. Climbing back up I had to boot pack with skis on backpack for nigh on an hour (damn tough), superb spring snow but very heavy slush on the piste coming back down in the early afternoon. It must be something to do with the thermometer reading 18C degrees in the shade, like a hot summer's day in the UK out on the patio! Sunny Sunday and freeze overnight. And warming up fast. 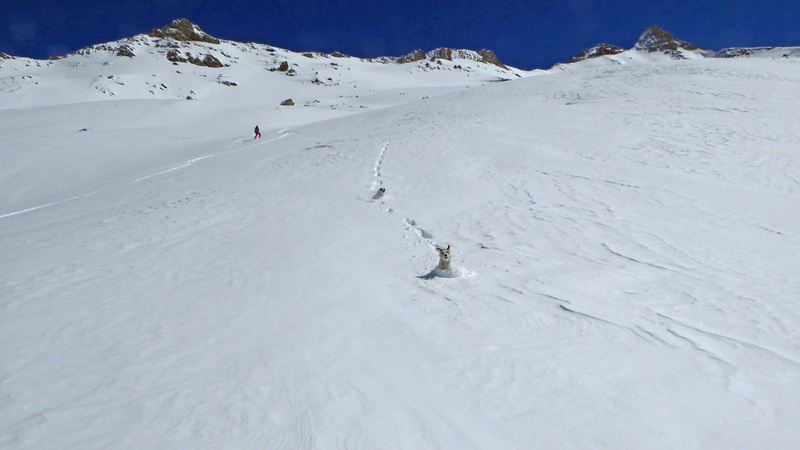 Who knew, yesterday, what we were going to experience snow pack wise on the Vallon de Roche Noire with the Rando Chiens. There was 5cm+ of fresh on a spring (slushy) base. We hiked up 700m while the dogs dashed off chasing marmot whistles. It was pretty warm skinning up (we started out at 9.30am) but at 600m a cool breeze kicked in so we were glad that we brought layers and jackets! The first five or six turns confirmed the spring snow - and, as we carved the top layer of fresh white snow, it revealed the Sahara sand layer below creating swathes of pinkish tracks. The Randos now stay right on the backs of Gav's skis while I wait behind to make sure they aren't diverted by marmot calls or scents. 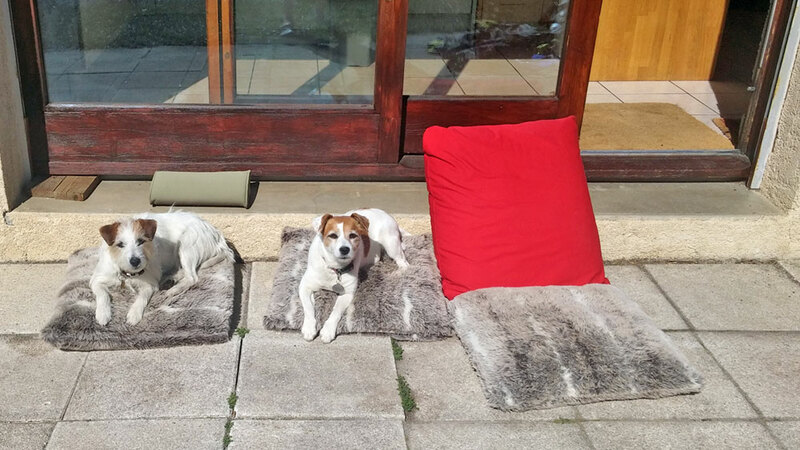 Home by 13.30pm and a chill on the patio in the afternoon sun. It's snowing even in the valley here in Serre Che at 17.30. Guess where we were today.? Yep the one and only La Grave with the one and only lift! But, as the lift had been closed for two days and there was around 20cms of snow up there while it was raining here, it seemed like the obvious choice. And especially as we awoke to blue sky. But, as we drove over the col all we could see was La Meije wrapped in a cloak of cloud with plumes wafting up the valleys like the wraiths in a Night On Bald Mountain (the scene in Fantasia that haunts kids for life!). It was only on the lift from P2 to P3 that we burst through the cloud to the blue sky. The conditions were interesting - some fresh, some polystyrene crud, some heavy to keep you on your toes. Or which ever part of the ski gets you down. And, elsewhere between here in Serre Che and La Grave, the snow has been sliding downhill like melting sorbet off a spoon. This afternoon, the thermometer hit 18C on our patio. It's always a tad depressing to see umbrellas in a ski resort even at the end of the season. But usually it means that, at least, it's snowing high up the hill. 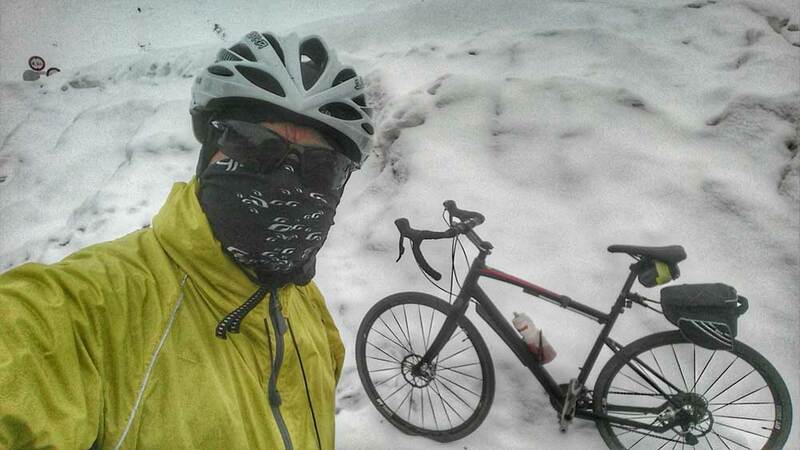 But, yesterday, it bucketed down and, apparently, was turning to slush at 2500m. The forecast was looking good for snow and colder temperatures, this weekend, but even that has gone off the weather radar. Well, it must be ok in La Grave. Right? They've had 20cms BUT the lift is closed, officially because of the 'bad weather' but more likely because the place is empty with only a handful of skiers in the resort. The Rando Chiens are happy, though. 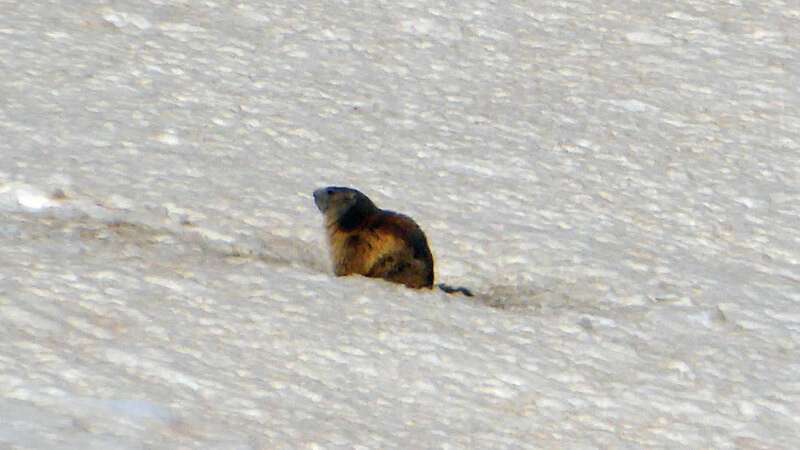 Another hike, yesterday, and there was the siren call of the first marmots of the year. They whistle and wave at the Jacks, who haven't a hope in hell of coming anywhere close but love the run across the mountain meadows. 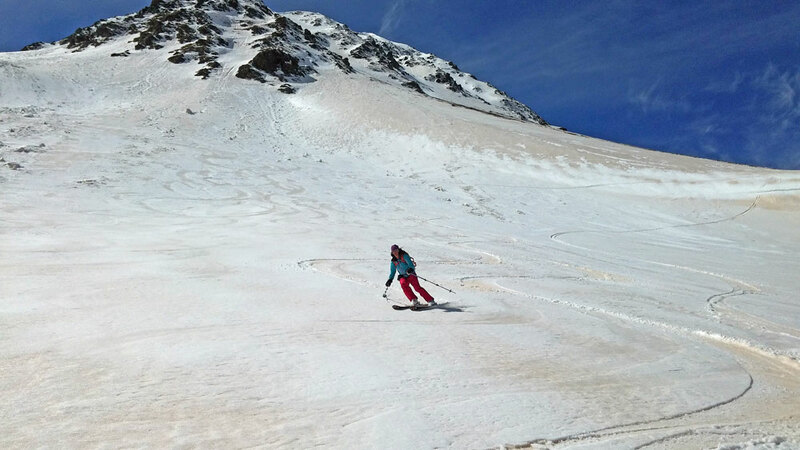 Last week, we had glorious spring skiing, today we're glumly staring out at a blanket of grey cloud and drizzle. But, hey, we live in the mountains and the weather's ever changing. Winter's coming back, next week, if you can believe the forecasts (and who does?). Meanwhile, yesterday, we made alternative fitness arrangements - I dug out my running shoes, Gav put on his cycle helmet and the Rando Chiens found their tennis ball. Ditto again, today, I think!